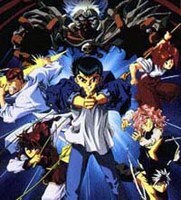 The "YUYUHAKUSHO" characters are owned and controlled by YOSHIHIRO TOGASHI/SHUEISHA • FUJI TELEVISION • STUDIO PIERROT. ©1994 TOHO, Studio Pierrot and Movic. Plot Summary: When the Spirit World is flooded due to an unusual rainfall which overflows the River Sanzu (aka the River Stynx), Lord Koenma senses an extremely powerful enemy. He entrusts Death God Botan, to deliver to Spirit Dectective Yusuke, a mysterious item which must be protected from the invading enemy. However, by the time Botan finds Yusuke, she's too weak to explain the situation. Yusuke and his friends are left in the dark about the new enemy, but not for long. Soon it is a battle for Earth between mere Spirit Detectives and the almighty king of the Netherworld.